Marc and Joan Hunter, the head coaches at South Lakes High School, knew they had a superstar. They marveled as this kid finished second in the state in cross country. They watched in awe as the freshman — a freshman — went on to win the two mile in the spring. Marc and Joan had met through coaching. Marc was then in his 10th year at South Lakes and Joan had joined him there after getting her own start at James Madison High School. Marc had been an All-American who had discovered a passion for coaching after being sidelined by injuries. Joan had been a successful middle distance runner with a background in exercise physiology who came to enjoy coaching more than her own running. This is to say that the Hunters were pretty pumped to have a kid, like Alan Webb, who was “off the charts,” said Marc. “We were just going [crazy]” thinking about his potential. The thing was, the Hunters had other kids, too: three of them, all toddlers. Thus, their dilemma. “There was just no way to be good parents with three toddlers and be good year-round coaches,” Joan said, reflecting on their decision to retire from coaching after Webb’s freshman year. In his senior season Webb would become the fourth American high-schooler to break four minutes in the mile and the fastest prep miler of all time. His run of 3:53.43 at that year’s Prefontaine Classic shattered a record, then held by Jim Ryun, that had stood for 36 years. The Hunters had missed their shot. If you had gone to a South Lakes practice in 1997 or 1998 you certainly would have seen a freshman-year Webb zipping through a workout. You also might have seen, somewhere on the periphery of it all, a kid playing in a sandbox. This was Drew Hunter, Joan’s and Marc’s second child. And Drew is now a rising senior at Loudoun Valley High School. And Joan and Marc are now Loudoun Valley’s cross country and track coaches; they’re heading into the third year of their second coaching career. And Drew, as it turns out, is now something of a superstar himself. This year he might even become the eighth American high schooler to break four minutes in the mile. Or the first boy from Northern Virginia to win the Foot Locker Cross Country Championship. Marc and Joan Hunter have nine children, including five whom they adopted. They’ve encouraged their children to play a sport to stay active, Joan said, and all of them have done at least some running, but none of have taken to it like Drew. But he didn’t take to the sport right away. Or at least he did not like it right away. When he was 9 or 10, Drew participated in youth track. He broke three minutes for 800 meters, which was pretty impressive, except he hated every step of it. He did, however, have to run a mile in gym class. But even after clocking around 5:20 as an eighth grader, Drew still wasn’t digging it. At that time, he said, “I just kind of assumed if you were good at it you had to do it, and that’s kind of why I did it.” Running for Drew was like a Plan C, “something for people who could not do another sport,” Joan said. His parents were surprised, then, when Drew told them he was going out for cross country. This news broke about a month before the start of cross country season, after which “I trained like three days a week, running 30 minutes just like every other day, jogging,” Drew said. His attitude, his parents said, was not impressing them much, either. Marc, on the other hand, was “ecstatic” when Drew placed seventh in Loudoun Valley’s time trial, positioning himself to make varsity. The team had not exactly been a powerhouse in recent years, but Marc still found the result to be encouraging. “Obviously, little did I know what was about to happen,” he said. In the first meet, Drew was Loudoun’s number three. By the fourth meet he was the best on the team. He might have even qualified for the state meet had he not gotten sick the week of regionals. 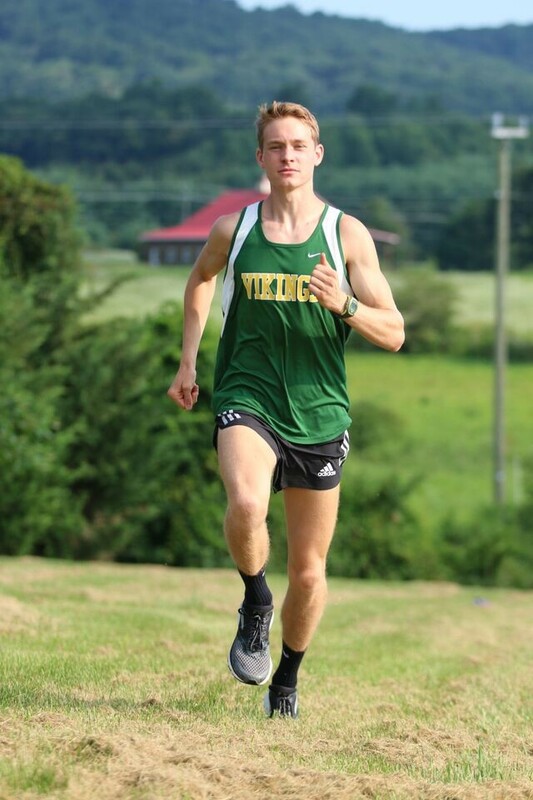 In the fall, Marc and Joan, seeing their son transformed and wanting to make sure he got good coaching, took over Loudoun Valley’s cross country and track programs. Drew, meanwhile, won his first cross country state championship. It was a huge field and the start was hectic. The boys shot out, lurching. Drew Hunter, on the rail, seeded 14th facing the best high schoolers in the country, reached out and put his hand on the back in front of him to stay balanced. The kids behind him did the same to him. The announcers on Flotrack, during the first lap, said he was from “Luden” Valley. They said this as you saw him shoot out to the second lane and squeeze past two guys to stay in the middle of the pack. At the bell lap Hunter was there at the front. With 300 to go, he made his move, kicking into the lead. It looked like he had it won, too. But then Justyn Knight, of Toronto, threw in a big surge and pulled up next to him and it looked like Knight might roll him. As soon as Knight pulled up next to him, though, Hunter responded with a savage surge and rocketed ahead in the final straight. Oh my gosh – what? WHAT? Hello! Those were the words from the FloTrack broadcast announcing that Hunter had run 8:16.31, a new sophomore class record, and had won with a ridiculous kick. “That was the first time I ever had a kick, ever — and after that it’s what I can trust and rely on,” Hunter said. In one race he had established himself as one of the top high school runners in the country and had dialed in on a very simple race strategy going forward. Hunter, in his sophomore season, won state mile and two mile titles and was runner-up in the two mile at the New Balance National Outdoors meet. He also ran 4:09 for 1,600 meters. Marc and Joan Hunter had last coached during an era in American distance running that valued low-mileage, high-intensity training. There is a reason that the United States squads for the 2000 Olympic marathon were each teams of one. “We just did not have good distance runners for the most part,” said Joan, who writes Drew’s workouts. Joan’s own philosophy about training changed when she turned to Tom Schwartz, perhaps better known in the LetsRun.com world as “Tinman,” for advice on competing in masters track. Joan, as it turned out, liked nothing more than doing a dozen really-fast 200s. Schwartz had other ideas, like running more miles, doing longer intervals with shorter rest periods, and doing tempo runs. Joan, in turn, started running some of the best masters times in the country at everything from 400 meters to 5k. And Schwartz now helps write Drew’s training, as well. Drew ran about 65 miles per week last year, rarely resting before races. This year he aims to run about 70 miles per week. Meanwhile, for someone who begrudgingly took up cross country, Drew has been quick to adjust his lifestyle. He credited his leap in his performances during his sophomore year to consistent training, eating better, and sleeping more. “I think when you are training at a high level you have to do the little things,” he said. For Drew, doing things right also can mean training alone, though he noted that some of his best friends are his cross country teammates. Doing things right also meant staying in Loudoun County recently while the rest of the Hunters went on a vacation to the beach. First, he isn’t a fan of running on the beach. Second, he had just started his summer training and was eager to get back into his routine. Part of what has Drew so focused is the realization, really, that if his parents can do it, he probably can, too. When he was growing up, he would watch his mom compete and see how good she was. His dad, who could not run after 23, only had stories and times, but eventually it all clicked. In his junior year appearance at the Penn Relays Drew Hunter won the mile in 4:07, becoming the first prep runner since Matthew Centrowitz to win both of the event’s individual distance races. Prior to the Brooks PR Invitational he had lowered his mile best to 4:02.36. This is in addition to winning everything in Virginia there was to win, including running 14:36 to set a meet and course record in the state cross country meet. Frankly though, heading into June’s Brooks PR Invitational, in Seattle, some thought Grant Fisher, from Michigan, was unbeatable. Fisher had recently become the seventh high school runner to break four minutes in the mile. He had not lost to another high school runner in years. That included a healthy margin over Hunter, who was fourth at last year’s Foot Locker Cross Country Championships, one of the deepest high school championships in history. It looked at times like Fisher was just cruising along, floating behind Mikey Brannigan through the mile in 4:24. He is a lean yet powerful runner with seemingly perfect arm swings. With 600 to go, Fisher moved into a clear lane and seemed to be biding his time. Hunter’s game was cat and mouse: he was out in lane two off Fisher’s shoulder. At the bell he popped out a little further into lane two to get some space and then he went, bolting, Fisher closing right with him. The rest of the field disappeared. It was Fisher and Hunter, hammering, strides overlapping in a way that conjured that mystical Tergat–Gebreselassie moment. This was anyone’s race. And there was 100 to go. There was 50 to go … and Hunter, like at Penn, found that gear and blasted ahead, winning in 8:42.51, by a second. “Grant’s one of my good friends,” Hunter said. “He’s a great guy, and he’s one of the guy’s I’ve looked up to.” Which is nice sportsmanship. But Hunter, too, is a sportsman. Competing is what makes him tick. Hunter might end up being number eight. But it also seems like he’ll need a race to win to do it. And that’s a good thing.